When I think of places… beautiful, far off places, my heart swoons. In such a respect- distance feels dreamy and romantic. full of hope. promising. when I think of people though… dear friends who are far from me geographically- my heart aches. I ache. A drive which could fill hours feels like it may as well span oceans. When I think of relationships- my heart cracks. Someone in the next room yet reaching out to them feels as impossible as stepping over, onto the next continent. Always. It ALWAYS comes back to perspective. An end in sight can hold relief. Fear. Bitter sweet. Sweetly bitter. Bitter. Between my heart and God- I want no distance. I want to be there, one reach away. Or in His arms. Anything that doesn’t feel like distance. And i want to no longer dream of traveling off, into the foreign cultures and sunsets. I want to go. to do. I want dreams to become living. I want distance, of any sort- to be my new four letter word. No more distance between where my heart longs to travel. No more distance between other coastal friends… other state friends. No more distance between him and i. her and i.
Isnt it interesting that many of us think of pain when we think on distance? I can cling to that last line that there is no distance between myself and God. Thank you for sharing your heart. 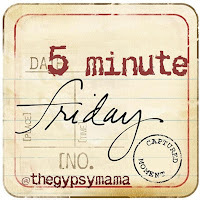 Today was my first time with Five Minute Fridays as well. Once you get going it's a little hard to stop! I really appreciate your post: You fit a lot of depth into a short time. I wanted to say "Amen" to the whole thing! Yes, someday those distances will be no more. What a beautiful post. "I want distance, of any sort- to be my new four letter word."amen. Thank you for sharing chica. What powerful thoughts! I've never thought of distance in that way, but you're so right about it's allure and also pain. Here's hoping we all find a way to close the distance!